One head fresh organic green cabbage (if you use purple cabbage it will need to ferment a few days longer). Set aside one of the outer leaves of the cabbage. Use a food processor, mandolin slicer or sharp knife to slice cabbage into thin strips. Place sliced cabbage into a large bowl and sprinkle with 1/2 tablespoons of sea salt. Knead the salt into the cabbage with your hands and let cabbage sit for one hour. During this hour the water should seep out of the cabbage. For a variety you can add some sliced carrots or some caraway seeds before packing the cabbage into the jar. After an hour, firmly packed the cabbage into canning jars, covering the top of the cabbage with the outer leaf you set aside earlier. Place the canning jar lid on top of the jar or use these special fermenting lids… Let the Sauerkraut on the counter for a minimum of three days, up to two weeks. 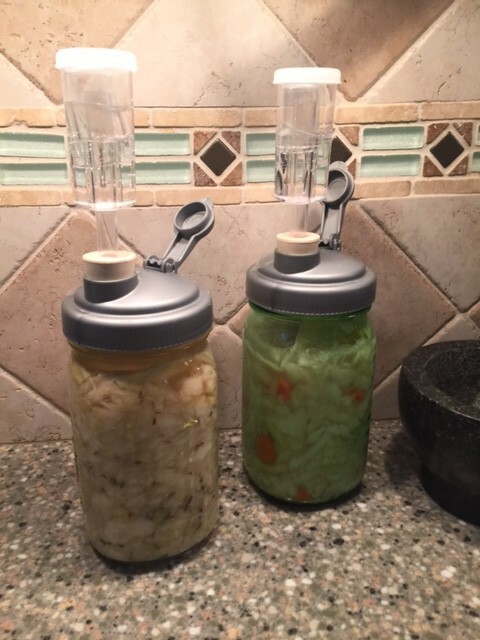 You can take off the lid And use a clean spoon to sample your sauerkraut. Refrigerate it when you like the taste.